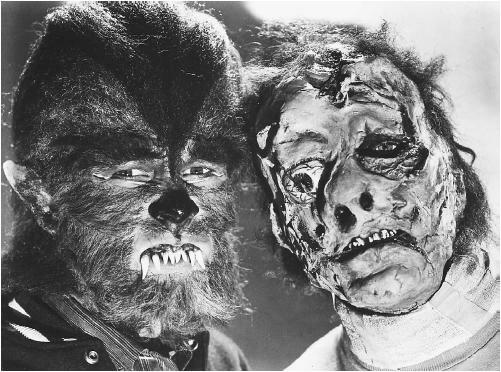 Even the most casual fan of Hollywood horror films is familiar with the classic creatures of movie monsterdom and the actors who portrayed them—such as the Frankenstein monster, as enacted by Boris Karloff (1887–1969); the Wolf Man, as played by Lon Chaney, Jr. (1906–1973); and the vampire Count Dracula, as immortalized by Bela Lugosi (1882–1956). However, some of the most well-known actors in motion pictures or television encountered monsters—or impersonated them—before their stars had begun to rise or after their clout at the box office had begun to grow less powerful. Of course there are also the cases in which an established star simply enjoys playing a bona fide monster for a change of pace. Dana Andrews (1909–1992), a minister's son, starred in such Hollywood classics as The Ox-Bow Incident (1943), Laura (1944), and The Best Years of Our Lives (1946). Then, in Curse of the Demon (1957), he played an American psychic investigator in London who was forced to battle a group of devil-worshippers who paid obeisance to a hideous ancient demon. Before James Arness (1923– ) became television's invincible Matt Dillon in the long-running series Gunsmoke (1955–75), he played an alien being, a giant, carnivorous humanoid vegetable who terrified a group of scientists at an isolated Arctic research station in The Thing (1951). In Them! (1954), he was a government agent trying to subdue giant mutant ants that had taken over the Los Angeles sewer system. The recipient of a special Academy Award in 1949 for his contribution to motion pictures, actor/dancer Fred Astaire (1899–1987), the master of the Hollywood musical, appeared in Ghost Story (1981) as one of a group of elderly men being stalked by a vengeful female shape-shifting spirit. In the science fiction classic The War of the Worlds (1953), Gene Barry, who starred in such television series as Bat Masterson (1958–61) and Burke's Law (1963–66), was a scientist attempting to thwart a Martian invasion of Earth. He also appeared in The Devil and Miss Sarah (1971), an offbeat Western about a satanic outlaw harassing his tormentor's wife. Raymond Burr (1917–1993), television's masterful attorney in the long-running law and order series Perry Mason (1957–66), was not quite so articulate in Bride of the Gorilla (1951). Burr portrayed a scheming murderer who was transformed into a human gorilla by a witch, the mother of a native girl he had betrayed. In the movie monster classic Godzilla (1956), he was an American journalist in Tokyo covering the story of a radioactive, prehistoric monster's devastation of Japan's capital. Burr's scenes were deftly spliced into the original Japanese footage to ensure the film obtaining a worldwide audience. In The Devil Within Her (1975), Joan Collins (1933– ), the manipulative Alexis of the television series Dynasty (1981–89), had the role of a nightclub entertainer whose baby had been cursed by an evil dwarf. She fared little better in Empire of the Ants (1977), when Collins portrayed a real estate broker who, through a bizarre transformation machine, became a slave to intelligent, human-sized ants. In the science fiction classic Donovan's Brain (1953), Nancy Davis (Mrs. Ronald Reagan) (1921– ) played the girlfriend of a scientist who falls under the telepathic control of the rich man's brain that he is keeping alive. The star of such motion picture masterpieces as Champion (1949), Lust for Life (1956), and Spartacus (1960), Kirk Douglas (1916– ) faced supernatural monsters in two films. In The Chosen (1978), he played a nuclear power industrialist whose son (Simon Ward), turned out to be the Antichrist, perhaps the ultimate monster. In The Fury (1978), Douglas's luck as a father was little better when his son (Andrew Stevens) developed incredible psychokinetic powers that he began to use against others. Although Clint Eastwood (1930– ) handily dealt with thugs, outlaws, and criminals later in his career as hardened police officers or lawmen, in his cinematic green years, he was put up against bizarre monsters that were much too large to punch out or even to bring down with a .357 Magnum. In Revenge of the Creature (1955), he played a laboratory assistant to a scientist who was involved in placing the captured Gill Man from the Black Lagoon on exhibit at a Florida aquarium. That same year, Eastwood was a jet pilot trying to kill a giant tarantula that had been created in a laboratory experiment in Tarantula. Peter Graves (1921– ) became well known as Jim Phelps, the authoritative director in the television series Mission Impossible (1967–73; 1988–90). As a scientist in Red Planet Mars (1952), Graves established radio contact with Martians. Courageously, Graves attempted to thwart the takeover of Earth by a Venusian creature in It Conquered the World (1956), and in The Beginning of the End (1957), he battled aliens and their underground menagerie of huge creatures. at First Bite (1979), Hamilton brought his film career back from limbo with his portrayal of a comedic vampire. In 1968 Charlton Heston (1924– ), the star of The Ten Commandments (1956) and Ben Hur (1959), for which he won an Oscar, appeared in Planet of the Apes as an astronaut who arrived in Earth's future to discover that intelligent apes were ruling the planet. He continued his role as an astronaut displaced by time in Beneath the Planet of the Apes in 1970. In the grimly futuristic The Omega Man (1971), Heston is the single human immune to a terrible virus that is decimating Earth's population after the radiation effects of a nuclear war and is turning most of those surviving into murderous mutants. In The Awakening (1980), he was an archaeologist faced with the decision of whether or not to kill his daughter, who has been possessed by the spirit of an ancient mummy. Before he was "Little Joe" on television's venerable Western series Bonanza (1959–72), before he was a nearly perfect father on Little House on the Prairie (1974–82), and long before he was an angel on Highway to Heaven (1984–89), Michael Landon (1936–1991) was a hairy monster in I Was a Teenage Werewolf (1957). Landon played a troubled high school youth who was transformed into a werewolf by a misguided scientist who believed that he was conducting experiments to improve the human race. The winner of the Best Actor Oscar in 1975 for One Flew Over the Cuckoo's Nest, as Best Supporting Actor in 1983 for Terms of Endearment, and again as Best Actor for As Good As It Gets (1997), in his early years as an actor Jack Nicholson (1937– ) squared off against two masters of the supernatural in The Raven (1963) with his portrayal of the son of a man transformed into a large raven (Peter Lorre, 1904–1964) by a nasty wizard (Boris Karloff). In The Terror (1963), Nicholson was a Napoleonic officer who encountered a witch, a mad baron (Karloff), and the vengeful spirit of a young woman. Nicholson walked the thin line of madness in The Shining (1980) and erupted on the screen in demonic, axe-wielding fury, goaded to violence by the supernatural forces in a mountain resort. In The Witches of Eastwick (1987), Nicholson got promoted from the demonically insane to an entity that may have been Satan himself—or at least a high-ranking demon. Nicholson made an excellent werewolf in the film Wolf (1994), skillfully achieving the trauma and terror of an ordinary man undergoing supernatural transformation. In Mars Attacks! (1996), he was the president of the United States attempting to defeat the bug-eyed invaders from Mars. Leonard Nimoy (1931– ) was playing aliens long before he became Mr. Spock, the science officer of the Enterprise on the original television series Star Trek (1966–69). In In Satan's Satellites (also known as Zombies of the Stratosphere, 1958), he was an alien soldier who was part of a squadron determined to conquer Earth. He also had a small part in The Brain Eaters (1958), wherein alien creatures feasted on human gray matter. Donald Sutherland (1934– ) pounded a stake into the heart of his bride in Dr. Terror's House of Horrors (1965) when he learned that she was a vampire. In Invasion of the Body Snatchers (1978), he was a man desperately trying to destroy pods from outer space that grew into human beings, replacing the original persons with look-alike alien creatures. Sutherland returned to fighting vampires with a vengeance as The Chosen One's mentor in the original film version of Buffy the Vampire Slayer (1992). Halliwell, Leslie. Halliwell's Film Guide. 6th ed. New York: Charles Scribner's Sons, 1987. Katz, Ephraim. The Film Encyclopedia. New York: Put nam Publishing, 1982. Skal, David J. The Monster Show: A Cultural History of Horror. New York: Boulevard, 1997. Stanley, John. Creature Features: The Science Fiction, Fantasy, and Horror Movie Guide. New York: Boulevard, 1997. Dana Andrews also played in "Gargoles" A very scary movie with great makeup for devil looking Gargole. As far as Leonard Nimoy goes, his best known bit part in a SF film is as a military officer at an intelligence Center in "THEM!" (1954). His one line was something to the effect of "If there's a tall story to be told, Texans will tell them." Also, as far as "Them!" goes, Fess Parker is the Texan who told that "tall story" about seeing Giant Ants. Walt Disney viewed this film while considering using its co-star, James Arness, for the lead in Davy Crockett. In the one scene that the two actors appear together, Parker towers over Arness. Disney decided to go with the taller actor.